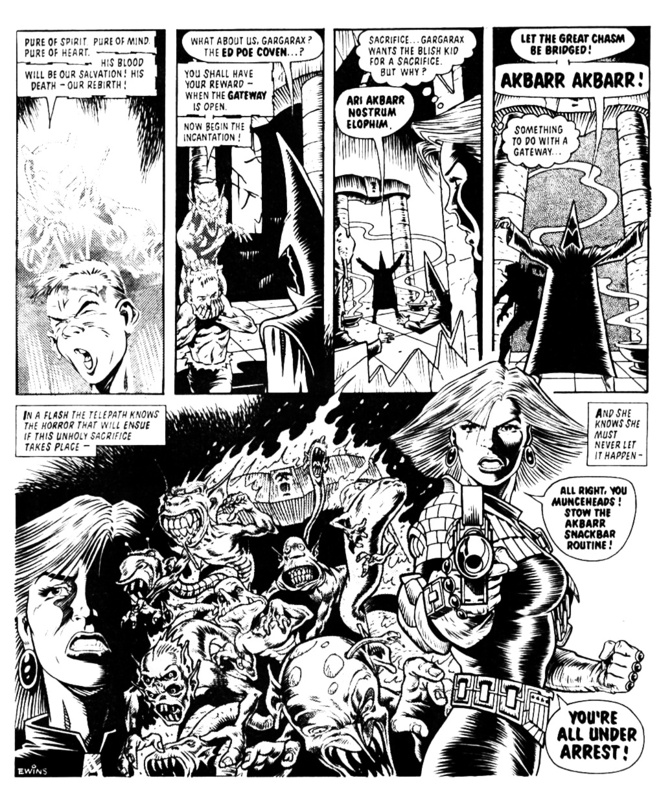 2000AD comic Prog #472 (31st May 1986) | 'TAIN'T THE MEAT… IT'S THE HUMANITY! 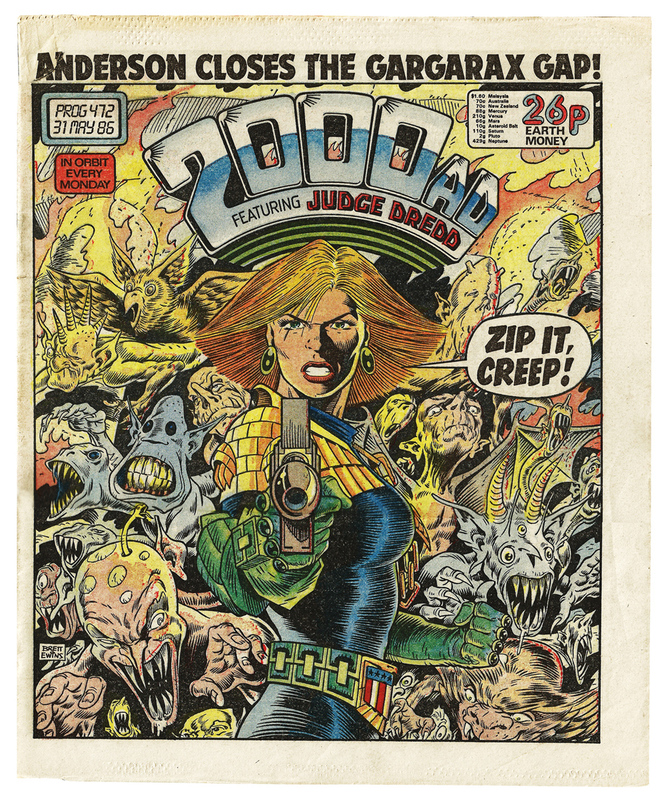 Brett Ewins was the cover artist for Prog #472 of weekly British science-fiction comic 2000AD, which featured this eye-catching rendition of fan-favourite Judge Anderson. Cover dated 31st May 1986 this Prog (issue) highlighted the fifth instalment of the Anderson, PSI Division story The Possessed written by Alan Grant. Ewins did a great job with this cover, depicting Anderson in a classic action pose surrounded by a selection of nightmarish creatures. Although it was a dramatic cover eagle-eyed readers may have noticed that the image of Anderson is repeated from inside the issue. I can only assume that deadline pressures forced Ewins to reuse the image on the cover. It’s a bold and arresting cover none-the-less. The rest of Prog #472 is a mixed bag. The issue kicked off with Anderson, followed by the forgettable strip Bad City Blue. Next up was a two page poster entitled The Law Loves You by artist Steve Dillon. Judge Dredd received the coveted full-colour centre spread with part one of Riders on the Storm, and Ace Trucking Co. came next. Strontium Dog Johnny Alpha was still gunning for revenge in part four of Rage while the single page Sooner or Later rounded off the issue. It wasn’t a terrible issue, just not a great one. Apart from his work on 2000AD Ewins is mostly remembered for founding the monthly comic magazine Deadline with friend Steve Dillon in 1988. Unfortunately Ewins had a troubled career as an artist. Overwork led to a breakdown in 1991, a blow from which his comic book career never really recovered. And, although he enjoyed some success as a painter, his troubles reemerged when he was charged with causing grievous bodily harm in 2012. Sadly Ewins passed away a few months ago from a short illness. He leaves behind an impressive selection of work and this cover for 2000AD comic is one of my favourites.